Would you like to undo the effects of time, sun or heredity would take on your skin? When you look in the mirror, do you see a tired, aged appearance? Remember a time when your skin was smooth and supple? Today it is possible to start turning back the hands of time with Micro Needling + Meso Peptide treatments. Micro Needling Plus has minimal to no downtime. It is a in-clinic treatment which stimulates normal collagen production using multiple micro- stainless surgical steel needles. 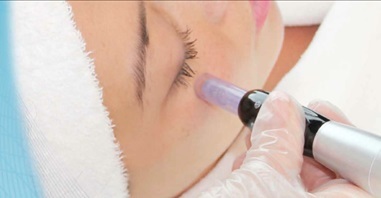 The top layer of the skin is preserved while the skin needling, causes tiny micro breaks within the skin. In response the skin cells release a series of growth factors and proteins which promote the production of collagen and elastin in the skin. This is further enhanced by application of meso-peptides immediately after needling. This treatment improves your skin by inducing the increased production of collagen, facilitating natural repair and growth, making the skin stronger and thicker. You will feel many fine needles on your skin area where the therapist is working. Treatments require no downtime and have no pain. A topically applied anaesthetic is applied to minimise any discomfort when receiving the treatment. Age and skin conditions will determine the number of treatments required to achieve the maximum effect. For more common skin conditions may require anywhere between 3-8 treatments with 3 to 4 week intervals between visits. The results are evident from both the skin texture and its appearance after the very first session. What results can I expect, and how soon? Depending on the area treated, you will notice an improvement in your skin’s appearance. Acne scars will be less obvious. Age spots and fine lines are greatly diminished. Your skin will be softer, smoother, and younger-looking. After your first treatment, your skin will have a fresh pink glow. Improvement continues throughout your treatment program. You will begin to notice visible results after about the third treatment. We are a medical practice dedicated to delivering the highest level of care in the fields of aesthetics. Our caring and skilled staffs are ready to address your medical and cosmetic needs. Our comprehensive skin, face and body centres are located at Kajang and IOI CITY MALL, Putrajaya. Our clinic at IOI City Mall, Putrajaya is the only aesthetic centre at Putrajaya and Cyberjaya region that is dedicated to provide medical aesthetic services such as PRP, Laser, Botox injection, Filler injection, Chemical peel, Hair removal, Micro-needling, Body slimming, Laser facelift (Accu-lift or accusculpt lift) and many other aesthetic services. At our IOI CITY MALL, Putrajaya and Kajang aesthetic centres, you will sure to receive professional medical aesthetic treatment with proven result and at competitive price.